Are we really almost entering February? Christmas was just a few days ago, time really flies by. Nonetheless, February is here, the Cupid is getting ready to leave his cave so better stay in and play some tanks. Let’s have a quick look at what you can expect in World of Tanks for the next upcoming weeks. 1-28 February: The Year of the Pig will start soon! On this occasion, you will be able to win a lot of XP and consumables if you charge into battle with your favourite Chinese vehicles! 2-4 February: From Private to Major, choose your difficulty with this special full of great challenges per class. 5-8 February: Grab your warhorn; it’s time to gather the best tankers in a platoon and/or a clan to unlock great rewards! 9-11 February: Work work work work! ? Get ready for some exercise, and a lot of repetitions with this new special – where more tokens give you more rewards! 14-17 February: It’s time to show your loving side, commanders! 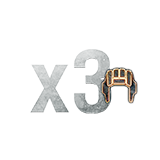 Treat yourself with great discounts, chocolate, and a sweet x4 XP bonus! 16-18 February: This year, we will extend Valentine’s Day with even more occasions to show some love to your favourite vehicles with Personal Reserves, consumables, and equipment! 19-22 February: Don’t worry though, February will not be entirely dedicated to tanks alone. This new edition of the famous Crew is Crucial is here to restore some balance between them and the men and women who cruise them! 23-25 February: The fever is rising, once again. Prepare your tanks, your pills, and be careful not to let all this XP go to your head! 26 February-1 March: Charge straight into battle for chain missions, featuring great trials, and a large variety of rewards. Previous Entry World of Warships 0.8.1 Supertest: Russian Battleships, Radar changes and more. Next Entry Frontline is almost here!